Scrap the orderly and the pristine and watch how vibrant and spirited your home can become. As a collector, lover of neon splashes and dedicated follower of eclectic style, I am perhaps the polar opposite of a perfectionist when it comes to my home. Of course, there’s nothing wrong with matched furniture, clean and clear surfaces and a harmonious palette of elegant neutrals, but sometimes it’s nice to break the rules, free yourself from style constraints and go wild. Check out 10 reasons to ditch perfectionism and try something a little bit different. 1. So you can embrace yard sale finds. Let’s face it, if you’re a perfectionist with a penchant for fixtures and fittings that are super shiny and brand-spanking-new, you probably don’t love the idea of foraging around at a garage sale or secondhand shop. For me, this is where some of my most interesting finds have come from. Be it a pretty piece of cut glass, a length of vintage fabric or a battered leather suitcase, I find these well-worn, well-loved treasures add so much personality and flair to a home. 2. Because untidy piles are things of beauty. There’s something delightful about creating an eye-catching display out of all your treasured pieces that don’t naturally have a home. This rustic, homespun storage hub was created from old wooden crates to utilize the space under the stairs. Fill your display with vintage signs, old books, retro radios, tin lanterns — basically anything that strikes your fancy — and let it evolve as you discover new pieces. 3. So you can color-clash to your heart’s content. Ditch the strict, color-coordinated vibe and go crazy with bold neons, metallics and sumptuous dark tones all at once. Being bold with your walls, accessories and furniture will create an uplifting ambience to get you through those dark winter evenings. 4. Because you can create your own movable art gallery. Forget matched frames and identically sized photos. A series of propped-up pictures, ad hoc postcards, prints and artwork can be just as pleasing as a carefully curated gallery. Bare white walls look fabulous as a backdrop to a ledge filled with colorful artwork, whether in the bedroom, living room or kitchen. And best of all, you can switch around and add to your gallery whenever you acquire new items. 5. To get the most out of your materials. Leather, wood and metal only get better with age and use, so don’t hide away worn patches on your sofa or disguise the odd scuff on your oak refectory table. Pieces like this will develop a lovely patina over time that will add character and history, which means we can sit back and relax without having to worry about our furniture. 6. So you can try a distressed paint finish. I’m sure we’ve all been tempted by the charm of distressed furniture. A beautiful, well-worn paint finish offers so much character, hides the dust beautifully and works with contemporary pieces too. For authenticity, look for pieces that have worn naturally over the years. Or, if you like getting your hands dirty, give it a go yourself with a can of chalky paint, some steel wool and a little wax. Who knows, you might love it. 7. Because you need an excuse to use up your paint samples. Don’t throw out your paint samples just because you’ve decided against that particular shade for the walls. 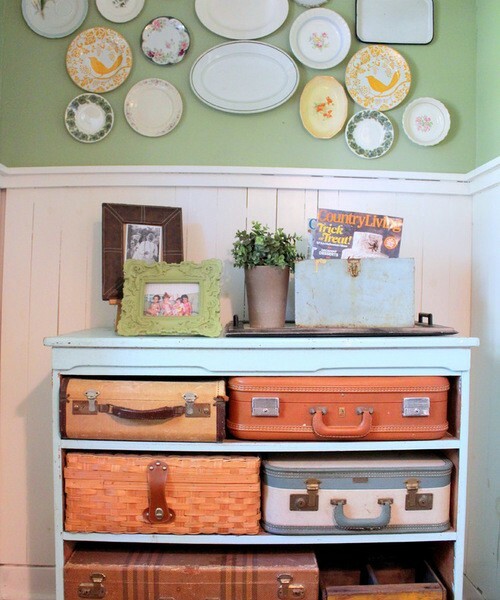 Instead, save the miniature cans and revamp an old dresser or chair. You’ll end up with something you won’t find anywhere else. 8. So you can put your ‘beautility’ items on display. Beautility — where storage utility and beauty meet — gives you the perfect excuse to display all the vessels and vases you’ve collected. Stick to a similar color palette for a harmonious look, but feel free to mix different sizes, shapes, prints and patterns for an individual feel. 9. Because any object goes. Letting go of perfectionism opens you up to an entire world of quirky and interesting objects that perhaps don’t fit into any particular style or category. It allows you to fill your home with objects that have a history, tell a story and say something about you. 10. So you can mix and match with abandon. Once you ditch perfectionism, the interiors world really is your oyster. I love how the combination of the patterned retro armchairs, modern pea green sofa, pretty wallpaper and colorful cushions in this room shakes things up just a little.